Some of the Shazam! merchandise has been previewed by director David F. Sandberg. The long-awaited movie is only a few months away from hitting theaters, which means that it’s time to start seeing some of the other promotional material for the movie, including some pretty sweet looking action figures. And since Shazam! will be more of a family oriented movie, these new action figures and the rest of the merchandise should end up being pretty popular upon the movie’s release. David F. Sandberg posted some of the Shazam! merchandise on his Instagram account and he’s pretty excited about these toys, which is understandable. 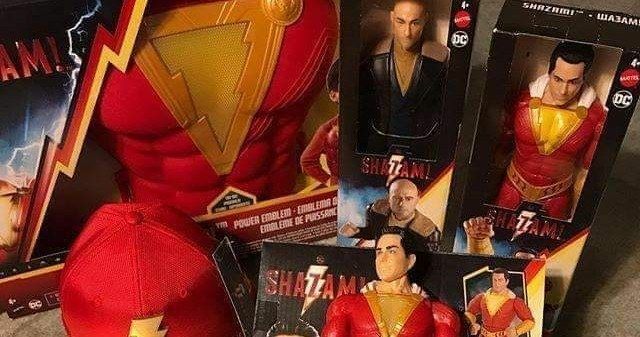 One of the main pieces is the Thunder Punch Shazam action figure along with the Doctor Sivana action figure. Sandberg even made a quick video of the hero and villain getting into a battle. Elsewhere, there are more collectibles, including a child’s hat with a gold bill and what looks like a child’s chest plate so they can pretend to be the superhero after they see the movie. The DCEU is on a successful role at the moment. Aquaman hit theaters in December and it just crossed the $1 billion mark at the box office, shattering expectations. This follows the tremendous success of 2017’s Wonder Woman, proving that the DCEU’s rocky start might finally be old news. Jason Momoa and James Wan are riding high on the success of the movie and looking towards a sequel at the moment, while Wonder Woman 1984 recently wrapped production. It’s going to be very interesting to see how Shazam! fits into all of this when it opens in theaters. Shazam! hits theaters on April 5th, which is just around the corner, so expect to see a lot more of the merchandise as the release gets closer. Zachary Levi recently revealed that he’s been getting into scuba diving and admits that he’s never been more jealous of Aquaman‘s powers as he is now. The actor wrote a post on social media talking about his jealousy and then asked Jason Momoa if he can help learn how to talk to the fish next. While that probably won’t happen, Levi is clearly thrilled being involved with the DC world and David F. Sandberg is pretty pumped on the merchandise. You can see a preview of the Shazam! toys and merch below, thanks to David F. Sandberg’s Instagram account.